UPDATED: Wed., Dec. 5, 2018, 11:24 p.m. 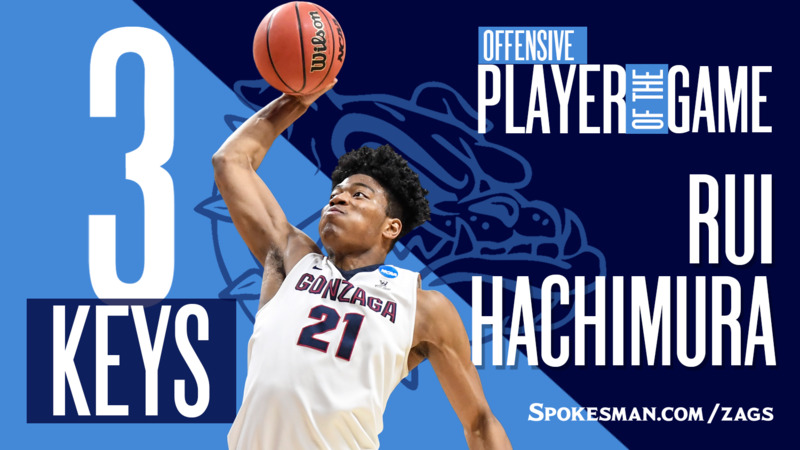 It had to be Rui Hachimura’s clutch jumper from the elbow, giving Gonzaga a 81-79 lead with 0.6 seconds left. He rose over three defenders and coolly drained the shot as the Kennel erupted. It earned him a spot next to Bill Walton for the postgame interview. Honorable mention: The Huskies had jumped out to a quick 15-2 run to open the second half, punishing the Zags for turnovers and bad shots. It was 45-42 UW at the 14:06 mark in the second half before Filip Petrusev took a Zach Norvell Jr. feed and turned over his left shoulder, powering his way to an and-one. He drained the ensuing free throw and tied the game at 45. The Zags never trailed again. Can Hachimura play or what? Finishing with 26 points on 9-of-20 shooting, the junior from Toyama, Japan, continues to flood the stat sheet. His highlight was a one-handed, high-flying slam with 3:54 left in the first half. Josh Perkins snagged the rebound and found Hachimura streaking down the court for the easy dunk. He mixed in shots from the elbow, quick post moves to his left and right and drives to the basket where he outmuscled the Huskies. Time for Norvell to get some love for his defense. His length and quickness on the defensive end had improved this year, but what has been overlooked is his nose for the defensive rebound. Wednesday’s game was the fourth straight contest Norvell finished third on the team in rebounds. Published: Dec. 5, 2018, 11:15 p.m. Updated: Dec. 5, 2018, 11:24 p.m.